Beautiful bracelet in solid silver. Unidentified foreign punch + "lp" goldsmith's mark. 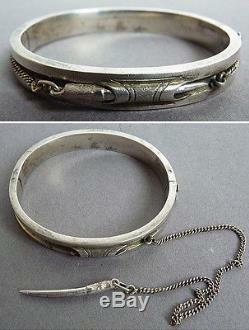 There is a chain that goes around the bracelet, ending with a point. It is probably a craft tool leather work or sewing? Internal dimensions: 5.6 x 5.2 cm. Hand delivery possible paris 9th. The item "old silver 19th century sterling silversmith lp" is on sale since Sunday, April 5, 2015. It is in the category "art, antiques, xix and before". The seller is "vakano" and is located in / in paris. This item can be delivered anywhere in the world.